A return visit to Broughton Castle near Banbury in Oxfordshire uncovers two very large portraits depicting servants who worked at the castle in the 18th century. Browse content similar to Broughton Castle 2. Check below for episodes and series from the same categories and more! and looked after this little-known jewel of a medieval mansion. And in case you're thinking, "That name sounds familiar,"
the explorer, and Hollywood stars Ralph and Joseph Fiennes. at Broughton, from the 1500s, right up to the current Lord Saye and Sele. surely the most flamboyant and spendthrift man of his time. threw lavish parties, would have two bottles of sherry at bedtime. That must have helped him drop off! The quiet country life here? That just wasn't for him. William was forced to sell off the contents, to pay off his debts. the swan, with her cygnets. like those who have come for our Roadshow today. These are so sumptuous, so colourful. Something that you wear on those long, dark winter evenings? No, hardly! I found them in my dressing-up box, as a child. -The things we find in dressing-up boxes. -since you were a child? And did you wear them or were they too big for you, then? No, I couldn't get my feet into them, at the time. -Oh. How did they come into your family? Well, my grandfather was an MP and he went out on trade missions. of these trade visits to Asian countries. And where do you think they are from in Asia? -Which is part of the Ottoman Empire. -And they are beautifully lined here. Really nice-quality silk ikat weave material. -It's made with... It's a resist dye. They'd tie bundles of threads together and dye them. Then, they take the bundles apart and weave these amazing materials. with a complementary red embroidery, there, and the metal thread. These are Ottoman. And you've got the typical tulips. for a wedding, for a procession, and they're in fantastic condition. I would say these are about 1890 to 1910. Yeah, well, that figures. He would have gone there in the 1920s. and textiles in general, but they would also appeal to fashion people. -would be something like £800 to £1,000. -I mean, that could be Art Deco. -Do you know that it's not? -I knew it was older than that. I know very little about its history or its age. it looks as though this is not quite the same as the bowl of the spoon. But whether I'm right or wrong I don't know. -I'm glad to say, you're wrong! -Oh, good! Good, I'm so glad. -It's like the day it was made. because it was made for people that had very simple tastes. and other decoration on the top of their spoons was rather irreverent. which is what this is. It's a Puritan's spoon. -It was made in about 1660, 1670.
of Cromwell's band, rather than a royalist. This one was made in the provinces. It's, in fact, made by a fellow called Richard Kirby, in York. So, it was made for a Yorkshireman. That does make sense, because a lot of my family were from Yorkshire. and would have owned this spoon. Was his name...? Did his name, or their name, begin with T? so it would be worth my researching that. -So, that's the family initial. The fact that it's made in York is a very good thing. If it were made in London, it would be worth maybe £1,000, maybe £1,200. The fact that it's made in York means it's worth about £3,000. Well, goodness me. I'm absolutely amazed. Are you really...? It's just been lying out, you know. with the most beautiful piece of French Art Nouveau. Art Nouveau was a movement that was really taking Europe by storm. what's your connection, how do you own such a beautiful piece? a very, very long way. It comes from Kiev in Ukraine. just for a weekly shop. all of a sudden, they spotted this vase and they bought it. I don't know how much they paid. It's stayed in the family all this time. It survived the Second World War. My grandfather was fighting at the front, he survived. was all their crockery, and, on top of it, was this vase. So, it survived all those trials and tribulations. and Art Deco museum there. especially this amber colour and also the patterns. I thought, "What's going on there?" I looked at the artist and it was Emile Galle. and, apparently, one of Emile Galle's signatures looked like that. So your question, really, today is, are you right? -You're not sure, are you? which you couldn't quite read. But actually, it's all there. which, the minute I saw it, I knew said "Galle". in France to a whole new level. It is what we would term a "cabochon cameo". And by "cabochon", it has everything. I mean, this vase really isn't short of anything for you. piece that has influences of the Far East, influences of Japan. It's such a piece of aesthetic art, it's breathtaking. This piece is around 1890. -Well, it's good, but how good? you are looking at something in the region of £8,000 to £12,000. "Viscountess Harberton". Just explain your link, then. she was one of the first missionaries, actually. And she gave this doll to my aunt, my mother's sister. -It would have been her doll, yes. -It certainly goes back to the 1800s. to start with. She's made of papier mache. Her head is a papier mache head. And her little arms and legs are carved wood. So, she's a mixture of two different materials. in the early part of the 19th century. I'm going to link it in, in fact, with what's in this tiny little box. -This is the most delicious, delicious box, isn't it? It came from the same aunt. -Yes, it was one of her treasures. ..is...an absolutely wonderful miniature book. We can see that it is... Gosh, it's a proper, proper book. And what's interesting to me, it might have a date in it. And it does. Right at the bottom there, says "Bijou for 1840." ..were bought almost as an accessory for a little doll. So, here we have the doll and her reading material for 1840! I think would probably fetch between £400, perhaps £450, £500 at auction. hugely interesting to collectors. And I would put even more on that. -I would put between £600 and £800 on it. Really?! I wasn't expecting that! We love a mystery on the Roadshow and this is our mystery object. Now, this belongs to you, sir. I'm not quite sure. It says on it "Waterloo." I've always wanted to know what was in it. And no-one has ever opened it, have they? No, not since it was put in that box, as far as I know. -So you brought it here today, to find out what's inside? from school. And her father came to collect her. and she washed it up and she put it to the back of the sideboard. -So, goes back a long way. Right, now do you want to hold this? And I'll lift the back off. whatever you wanted to use it for. It's empty, but there's no name. No name, either! Your little milk mug, when you were ten years old, is worth £400. I might put something stronger in it! -..a Biro lid in or something! Martin, behind you is your family home, the castle. you may have employed these two people either side of me? -So, these are servant portraits? might be what they call a still man. The still man, the guy who deals with the booze? because, am I right in thinking there's a fresh varnish on this? but that one we took out of the attic completely black. You could just see the shiny bit on the edge of his blade. with this little tear on his right eye. I noticed the tear. It's rather astonishing. that left him with a runny eye. and they've been given full-length portraits. -because his declaration of office is a patchwork leather suit. -Presumably to keep the thorns away? He's a hedge cutter, he needs protection. of their staff and it goes back to the 17th century. Most unusual, on this scale. I would put him safely into the 1730s. and his leather suit, I would say was slightly later. I would say it was probably 1770s, 1780s. and setting the rustics in their natural setting. -It could have been John. something like that. So, that might tie in with the dates. What do you think this says about your family? Was it, particularly, a kind and generous one to the staff? I think, for not being very nice to his tenants. And since then, there's been a great tradition of liberals in the family. giant-size portraits of the people who made their life work. -So, Martin, the subject of value comes up. on the man with the wine. perhaps £120,000, for what I think is Barker of Bath. This is really important sociological painting. This is portraiture like we normally don't encounter it. Wow! My jaw has just... rested on the floor. You know what they're for. "This is where I've been or want to go. "And this is where I've travelled to and from." You've got the trade routes on there. and then it gets better when you see inside the case. You've got the celestial globe, showing the positions of the stars. You know, what more could you ask for? You've got the maker there. in the period of George II. immediately, my suspicions are raised. These are one of THE most faked antiques. Please tell me you didn't pay a lot for it. No, we didn't pay a lot, actually. and he always told me about a globe. make sure we look after it. And we found it in a drawer upstairs. -So, no, we haven't paid a lot of money for it. When I say "faked", for a long, long time, they have been faking these. Look at it, it's, literally, like new. You open it and...like new. arguably the best maker there - Nathaniel Hill. -Dated 1754. All these things are just too good to be true. for the last 91 years. -How would it have been made? This is a travelling case, so that in a fish skin. These are made out of paper. They were made out of various skins. you could get that decoration on there. It's just... I think it's lovely. What do you still think - right or wrong? -all day long, at £2,000 to £3,000 at auction. -But this is WAY better than any I've ever seen at auction. If you want one, this is the best you'll ever get, without doubt. -The best I've ever seen. What we have here looks like a pretty ordinary book, doesn't it? -Tell me how you came to have it. I've known the book since I was quite young, actually. and left it to me, because I liked it so much as a child. from 1930, with these incredible parts, which fold out. and steam engines. Endless detail there, isn't there? -Did he let you play with it? because it's fairly fragile, as you can see. It's all survived perfectly well, so obviously, I was careful enough. -Why do you think he bought it? to him and that's what attracted him to it. This one's my favourite, the automobile. It's really fantastic. to have a look at what was inside. In a way, one could say it is seriously collectable. It's a movable book. This is the category that we call it. -Well, that's nice to know. More than your father paid? Yes, I think there's a pencil mark somewhere in the front saying £25. -So, not a bad return, yes! -Absolutely. Thank you for bringing it to the Roadshow. In the early '50s, my nan sent my grandad out to buy a blue vase. -And he came back with this? -OK. Did it fit the description? I think so. Probably a little bit bigger than she expected. -That's it. Certainly, a surprise. -So, whereabouts does it sit? It's not going to fit on a shelf, is it?! No, no! Unfortunately, tucked away behind the sofa. Where did he go to find this blue vase this big? It was Coundon Court, which is in Coventry. who was the Henry Singer of the motor vehicles and pushbikes. when it was first built in the early 1900s. and I think they tipped him off there was a blue vase there. -There was a blue vase going? We should look at it. It is the most magnificent thing. during the Third Republic, the official state French factory. with this gilding. This vase is all about the porcelain. Sevres are saying, "We can make a vase this big,"
and they want to show off the beautiful blue ground. as exhibition vases or for presentation. when they decided to decorate it. is still going today and they have amazing archives. and gilded for an exhibition in 1889, I think, in Paris. called Godding, an artist called Godding. So, we think it was made for an exhibition. you are going to be finding £5,000 behind your sofa. of the UK Holocaust Memorial Foundation. during World War II in previous editions of the Antiques Roadshow. the family jewellery inside it and, hopefully, to return one day. Jewels buried by families fleeing the Nazis. That's my very precious remnant of this story. A ring, a survivor kept hidden through several concentration camps. we know there are stories of hope and love to be discovered, too. Broughton Castle is surrounded by the most beautiful countryside. in the 19th century, it's that beautiful. from the 19th century, by John Faulkner. the glorious British landscape, that inspired many thousands of artists. Your watercolour is signed by John Faulkner. And it's inscribed, "A Farm Near Pinner." particularly in the early part of his life. -What's your connection to this watercolour? Well, I'm originally from Northern Ireland. especially away from the urban cities. he became an associate of the Royal Hibernian Academy at the age of 17.
is really the Irish equivalent of the Royal Academy. where all the main artists would aspire to exhibit. But later on in his life, he painted pictures in Scotland and England. I just really love the sort of narrative. tips in a little bit here with rooftops, suggesting a village. off to the village. They might be selling these pots. Lovely little church on the right-hand side. on the pond? It's a very pleasing picture. exhibited regularly at the Royal Hibernian Academy. Your watercolour is in lovely condition. Now, it probably dates to about 1870. -He was born in 1835, died in 1894. It's later on in his life. -because everything upstairs got burnt. but it was completely different to this one. I think my parents got it replaced after the fire. -Well, the good news is the watercolour survived. And, actually, this inset is also the original. But a beautiful country landscape. Its value - certainly £1,500 to £2,500. a little Swiss clock and you've got a selection of watches. So how many do you have in total? so quite a lot more than this. Do you wind them up, do you have them all running? The clocks are usually running, but not the watches. The watches get wound every now and again. You must have quite a noisy household. Keep everyone awake at night? I just shove tissue in the back. But what got you hooked into collecting clocks? but somehow it moved onto clocks, I'm not sure how or why. because they're far more portable, far easier to maintain. about one of the clocks that you've brought along here. and below the platform there's an interesting escapement. It's not a normal escapement wheel. I bought it and I was very puzzled by it. So, I was trying to read loads of books and find out loads about it. it's probably late 19th to early 20th century. What did you pay for it? Do you remember? -25, so that's a good price, I think. you generally sell at auction between £100 to £120. I'd like to be a horologist, make and design watches. So I'm going to have to be very careful about my position, am I? Are you going to be standing here and doing what I do? I'll be very disappointed if you don't. and long may you continue and learn more. -It's a French turkey, it's a dinde. You know, it's Christian Dior, it's absolutely right. It's just got everything going for it from the 1950s. But this was just the French being funny, it's a French joke. And you know, if I had a small waist, I'd love to wear it now. so he's like a French mayor or a functionary. I'd say it would easily make anywhere between £800 and £1,200. And he's probably actually a tobacco jar. who is this gentleman to you? this is Harold Blackburn, who was my grandfather. and he designed and built his own aircraft. -He built his own aircraft? Along the veins of the Wright brothers? -Very much along those lines, yes. and he flew the first scheduled air services in Britain in 1914. A real pioneer of the flying era? and his aircraft was requisitioned. on the 19th of August 1914.
in the Royal Flying Corps, and he was 35 years old. -And he went off and flew in France? and then everybody thought the war would be over by Christmas. and that was to defend the Suez Canal from the Turkish army. And we have this photograph taken from his aircraft of a Turkish camp? which is in the middle of the Sinai Desert. and this is the water tank. because it's very difficult to bomb. right in the middle of the water tank. -Where the water came out around here. And for these efforts he was awarded some quite special medals? for his efforts in the Sinai Desert. they got their own medals, and he has the Air Force Cross here. Yes, that's right. He remained in Egypt throughout 1917.
and he received that decoration. just showing how early he went out to France. because he was a keen sailor. throughout the entire German occupation. And when the Germans left, the medals were dug back up again? from the very earliest days of flying. aerial bombing missions, from the First World War. Again, almost unheard-of from that time. to pay £6,000 for your medals. They are...just stunning, from the very early days of the Flying Corps. -and telling us that wonderful story. Well, this is a seriously spectacular lump. Well, I use it as a paperweight at the moment. -How much paper do you have?! and it keeps it all down, so, yeah. -So tell me about it. -Well, my dad and I went to an auction. He is an art dealer, so he usually takes me along with him. So what was it that grabs you? it's obviously a sculpture, a glass sculpture. -At the time, it was very dirty. -the light just shined through it and it just caught my attention. -Well, good old Dad for buying it for you. There is a signature on the bottom, do you know who made it? Lucio Zanetti, I think - that's what we read the signature to be. Yeah, pretty good, pretty good. So it dates from about the '70s, and it's a free-made piece of glass. -which gives you this kind of stubbly-chin feel. of using glass as an artistic substance. I mean, this is... It's pretty rubbish as a drinking glass, this. -It is an out-and-out art piece. -So Dad paid 70 quid for it? That's got to be a 300- or 400-quid piece, I reckon. -I think you chose jolly well. it's a perfect place to find a fabulous garden seat. And after she died, it passed to my mum. She's since died, and it's mine now. and a lot of factories produced it - Minton, Wedgwood. but I can't find the mark on it. who's, you know, in the late 19th century. which often happens with a big piece of majolica like this. -Really, I've got for you the bad news and the good news. ..I'd have said it was worth £2,000, £3,000. But that's when the Americans were buying it. Not in fashion any more. Well, it was a wedding present to my late wife's grandparents. And the photographs you're clutching? -That's the bridegroom, Horace Dare Smith. and they both came from horsey families, and horsey businesses. -and to think that they knew and loved this bronze. But I understand you're not totally clear who it's actually by? but that's all I can say, yes. a biscuit you would dip in your coffee. through to the sort of beginning, really, of the First World War. I think he died in 1914. -And your bronze is dated - it's dated 1892.
and you've looked after it in the right way. You've not sort of polished it up. -..it hasn't been overcleaned, by any means. -Bronzes are not selling especially well in the current market. So I'm going to be a little bit conservative. I'd be putting an estimate of between £2,500 and £3,500. Mm-hm. It was worth coming! and he was a court tailor to the Hanoverian royal household. And this is a waistcoat of George III's that he made. cos George III came to the throne in 1762, didn't he? And he went right the way through till 1814. Well, now, let's just think if that would stack up. Your dress would be breeches, shirt, waistcoat, overcoat. and it was also...could be quite a flamboyant part of your dress. -The ancestor that you mentioned, do you know the name? Later Anglicised to Francklow - L-O-W.
he was registered as a clerk of the King's German chapel. Excellent, so that's great, so you've done the research. and it's got this fabulous shine to it, hasn't it? is to link it absolutely 100% to George III. So, value. There are two distinct values, aren't there? There's one as it is, which is, what, £500 to £600? And there's that fantasy "could it be, may it one day be proved" value. What's that? Probably not as much as you think. -if we could link it in to George III. George III had a LOT of clothes. Well, two partridge and a grouse. but what can you tell me about them? Basically, they've been in the family for as long as I know. They came to me from my grandmother, up in Scotland. -I was told they might be French, but I'm not totally sure. What they are is, in fact, Austrian. -It's a group of animalia bronzes called cold-painted bronze. producing this type of cold-painted bronze. of making this particular dust paint. Most of them were painted by women, at home, so a real cottage industry. You can just see how realistically done that they actually are. An incredible weight for this one. and the scale of those, in particular, is very good. -They are remarkably accurate in the way they've been painted. -Do you like them, do you enjoy them? I mean, I've had them, luckily, for a very long time. and they will continue to go through the family. so just maybe just turn of the century. -and would carry an auction estimate of between £1,500 and £2,500. possibly around £500 to £700, something like that. I would have been delighted. It's got lots of action. going round the corner, and he's nearly falling off. so they would have gone up, up and down, like that. So how does an American toy come to be here in rural England? -..who lived outside of the town of Llanelli. I'm not sure when, he went to America. And this is one of the items he brought back. It must have been quite a journey, actually, by boat at that time. And this is not the lightest thing to bring back, is it? I played with it as a child. -I was told to be careful! who were making cast-iron toys from the 1890s. from the first decade of the 20th century, so 1900, 1910.
so it's very rare to find a cast-iron toy here in the UK. -So that's another thing that excites me as well. nobody's tried to restore it. cos that's where the market is, that's where the collectors are. -we're probably talking about a figure of up to £3,000. But could be substantially more in America. Well, it's the evening and we're going into darkness. and the most particularly beautiful piece of mourning jewellery. Tell me about it, with you. Well, I don't know much about it. The only thing I do know is it came from some cousins of my grandfather. But, other than that, I know nothing at all about it. and we know that for a number of reasons. The first is, it's laid onto a background of human hair. beautifully arranged and glued to the background. And then it's overlain with lilies. But the lilies are made of the tiniest seed pearls imaginable. And they're significant because they're emblems of purity. all plants full-blown are suggestions of mortality. And here we have a jewel reminding us of our own mortality. So this is an emblem of love gone beyond the grave. -It's very romantic stuff, isn't it? is engraved with the name of the person that's being commemorated. In this instance, it's completely blank. it would have cost an enormous amount of money to have it made. of it leaving the family. -Probably hasn't left the family. This is probably one of your ancestors. of the highest possible calibre. and the meticulous craftsmanship - that it dates from about 1760.
up and down Regent Street, and they boasted of what they could do. could be arranged in the form of flowers, in the form of feathers. to those people to work them up. And why did you do it? was ever-present in the 18th century. that people who had died, you wouldn't remember their face. their hair - and wear it. telling us all of this. Couldn't ask for more, could you? And how to value it? It's a very hard one to do because it's a family jewel. and how are we going to put a price on that? £800 for this, maybe £1,200. -But you're not going to do it, are you? I don't know, maybe £200, £300. I can't believe it's worth that much. I am so jealous of you owning this. How long have you actually had the good fortune of owning it? and applied to the surface. which is a corruption of being partially gilt. -Look at that dragon's head! You know, that is so wonderful. -Of its type of work, it's the finest I have ever seen. -And it's not often you can say that. which is stamped on the base and just there. -Do you see that little V? -..that was put on in the 19th century. So, that would link up nicely with Batavia. -It's an extraordinarily difficult piece to put a value on. how much do you put on it? And it could go more. He wasn't going to come in. -So you're pleased you came? -Oh, I am. Certainly am. as our day at the Antiques Roadshow draws to a close. I wanted to show you one little item that had a lot of people puzzled. you pull it towards yourself and cut with your reaping hook. And this protects your hands. with the woodworm to prove it. 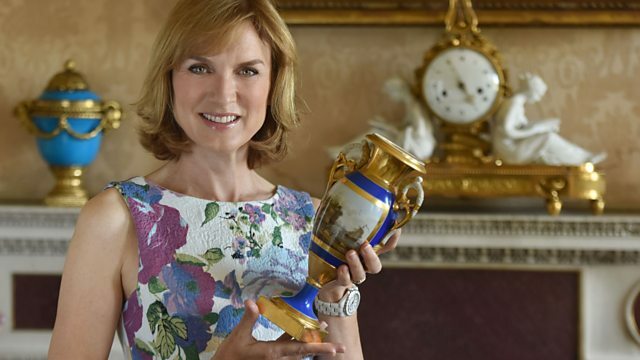 Fiona Bruce and the team pay a return visit to the magnificent Broughton Castle near Banbury in Oxfordshire. Objects exciting the team include two very large portraits depicting servants who worked at the castle in the 18th century, which art expert Philip Mould says are rare and sociologically highly significant. We hear the story of the man who is believed to have flown the first scheduled air service in Britain before signing up to be one of the first combat pilots in the Royal Flying Corp in 1914. And silver expert Ian Pickford is enthused by the arrival of the finest Chinese-made silver mug he has seen in over twenty years on the Roadshow.